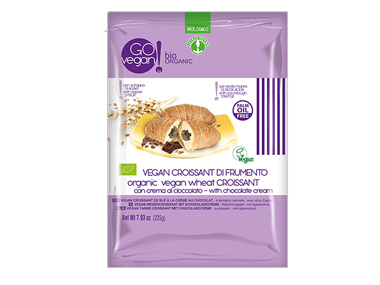 Buy Go Vegan Croissants with Chocolate in the UK from our online shop or directly from our independent Scottish store. Naturally leavened with sour dough yeast, and sweetened with agave syrup and filled with a delicious chocolate cream filling. These vegan croissants are made using sour dough yeast, sweetened with agave syrup and filled with delicious vegan chocolate cream filling. Croissants made without butter. We sell real Go Vegan and other Speciality Breads directly from our shop in Scotland and online throughout the UK. View more products from Go Vegan. Where can you buy real Vegan Croissants Chocolate safely online? If you are wondering where you can buy Go Vegan Croissants with Chocolate safely online in the UK, then shop with us. We are an actual health foods shop; with real people selling real foods and products. Our award-winning independent shop is located in Stirling, Scotland since 1976. You can buy our Speciality Breads in store or safely place an order with us online or over the phone. Vegan Croissants Chocolate - Go Vegan Croissants with Chocolate in Speciality Breads and Biscuits & Breads.